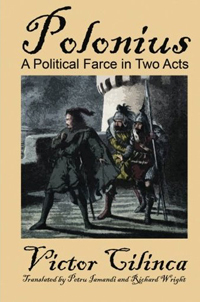 First performed in Galati, Romania, in 1996, Victor Cilinca’s Polonius is a play of political machination, social aspiration, treachery, and self-deception, set during the events of William Shakespeare’s Hamlet. The play’s relevance has escalated since it was first performed, with its barbed commentary on the media’s role in shaping our society being more incisive now than ever before. Translated into English by Petru Iamandi and Richard Wright, Cilinca’s Polonius reflects our world through a Shakespearean looking glass, the better to see it afresh.